It started drizzling and with the soft pitter patter and the help of google maps we found ourselves at Gelatorino. Upon first look, one might pass off Gelatorino as just another gelato place but just like how easy it is to judge a place by it’s first look,Gelatorino turned out to be the best gelato place ever. 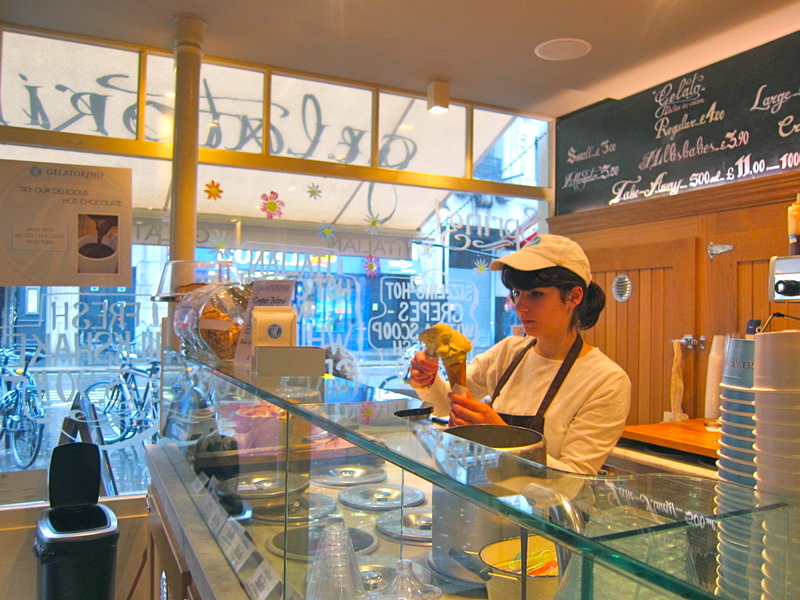 Unlike typical gelato places that line up their gelato in an enticing display…. 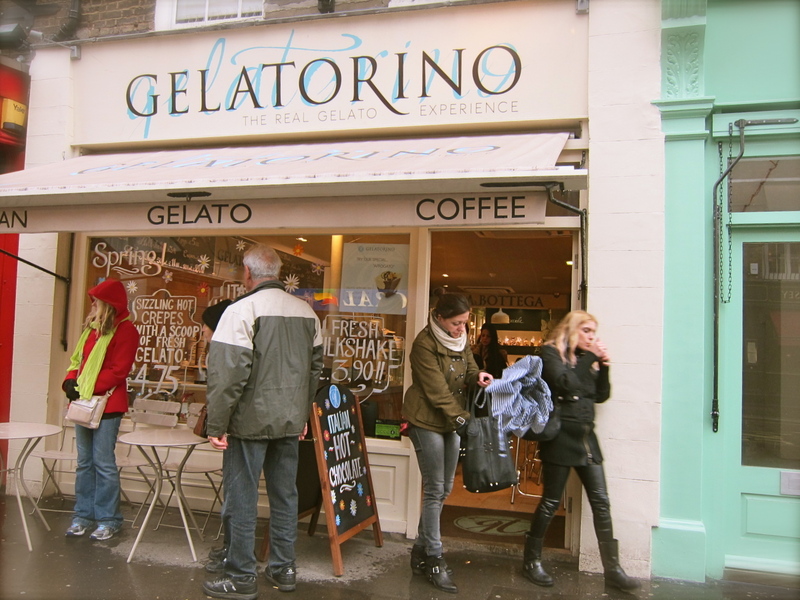 The gelato at Gelatorino are kept in pozzettis, refrigerated wells. These wells help to maintain the temperature, structure and freshness of the ice-cream. The lady scooper was really friendly and kindly offered us to try their flavours. With absolutely zero expectations… the first mouthful swept us away, we were madly in love with the amazing velevty consistency of the gelato and the evident taste of the quality ingredients used. There are countless of flavours to choose from: nougat, almond, chocolate hazel nut, vanilla… to fruitier sorbets. You can enjoy your gelato on a cone, in a cup or on a spectacular crepe. Priced reasonably at 3 pounds for two flavours in a small cup, the size of the small cup may fool you into thinking about the portion you’ll be getting. However a generous portion of gelato is laden in and watching the thick gooey goodness take form in your cup makes it hard for one not to smile. I had 2 flavours: cinnamon orange and pistachio,while my friend indulged in 4! He had chocolate hazelnut, pistachio, nougat, and choco chips. Honestly speaking this is by far the best gelato I’ve ever had in my life. Even after comparing it to the ones I’ve had in Italy, this is the best ice-cream we’ve had. The texture of gelato is usually seen and not tasted, well…the gelatos here are an exception. Here you taste it’s perfectly smooth and creamy texture yet at the same time there is a lightness to it that makes it a digestible treat. Every mouthful was a moment of pure pleasure. I’ve attempted to capture it on camera, but no photo will do it justice. You must experience the flavours and texture of it yourself! Our favourite flavour- hands down: Pistachio. It was glorious… I for one am not a fan of nuts. However this pistachio gelato was that good and that amazing for me to have a huge portion of it, praising it with wonderful things with each mouthful. 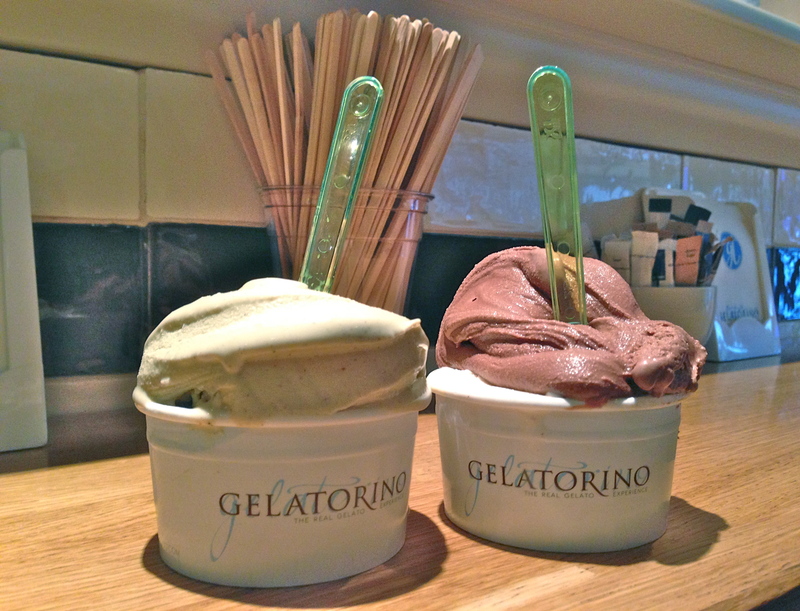 Gelatorino promises the use of top quality ingredients, no use of preservatives, colouring or artificial thickeners. Unlike places which makes you doubt self declared statements like these, the gelato here left us with no queries, and we became instant fans. They promise real italian gelato, and guarantee a gastromic gelato experience. Their food philosophy and the taste of their food are in perfect harmony. Their gelato takes after traditional gelato making techniques based upon Torino (gelato capitial in Italy), from conserving to mantecazione(the removal of ice crystals, and gradual texturing). Award winning Maestro: Alberto Marchetti is their consultant chef. Gelatorino also offers a selection of drinks. The americano my friend had was supposedly amazing, but I am not one to judge as I do not drink coffee. At the back of the shop is a corner with an exclusive range of italian biscuits. If you are unsure of how the biscuits taste they have individually priced biscuits in little glass jars at the gelato bar. We love how we discovered this place by sheer chance. What a gem this place turned out to be! Suprising finds like this one are simply amazing.